Melo Dominguez, Baja Arizona, acrylic on canvas, image courtesy of the artist. 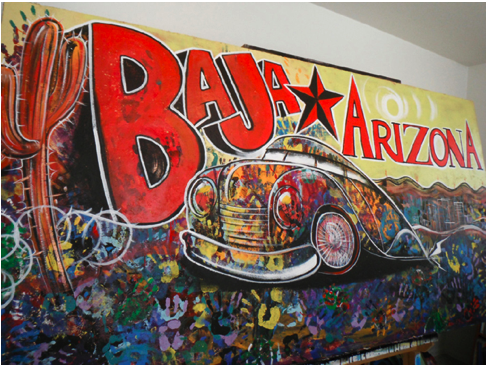 Beginning this Thursday, Nov. 17, 2011 the Arizona Museum of Art will be opening a new exhibit pertaining to the history and culture of the border region in honor of Arizona’s Statehood Centennial Celebration. The Border Project: Soundscapes, Landscapes & Lifescapes will present sound art, music, performance, painting, sculptor, installation, video, film and photography that examine historical and contemporary life in the U.S./Mexico borderlands region. Additionally he exhibition will acknowledge the complexities of border communities across all borders, including Asian Americans and Europeans. An opening reception will take place on Thursday at 5 p.m. at the Arizona Museum of Art, 1031 N. Olive Road, where artists exhibiting will discuss the exhibition and their own works. Throughout the duration of the exhibit there will scheduled events such as panel discussions, film screenings, festivals, concerts, storytelling and lectures related to The Border Project. The Border Project will continue through March 11, 2012 and a closing reception will take place March 8, 2012 at the Arizona Museum of Art at 7 p.m.